Alhamdulillah, The Islamic Online University Blog has published my article about dealing with Toxic Family Members. I have posted the article below, but please do visit the IOU Blog for some more excellent articles about Living Islam in today’s world. The website is blog.islamiconlineuniversity.com. Many comments under my first IOU Blog article, “Tips to Deal with Toxic People from Islamic and Counseling Sources,” asked for more information about toxic family members. This is a challenging topic, since family ties are extremely important in Islam. 3) Ideas to cope with toxic family members. 1. One of the main reasons that the Prophet Muhammad (pbuh) was sent is to uphold family ties. 2. Your parents must be treated with the utmost respect and kindness always. May he be disgraced! May he be disgraced! May he be disgraced, whose parents, one or both, attain old age during his lifetime, and he does not enter Paradise (by being dutiful to them). He who wishes to enter paradise at the best gate must please his father and mother. 3. Islam teaches us to treat our children with mercy and fairness. 4. The marriage relationship, overall, should be characterized by love, compassion, comfort and protection. 5. Showing kindness to your wife and family is highly rewarded. 6. A wife is required in Islam to treat her husband with respect and dutifulness. 7. Kindness to relatives is an Islamic duty. 8. Reconciliation and Forgiveness are ideals that we should strive for. The Prophet Muhammad (peace be upon him) said: “Shall I not inform you of something more excellent than fasting, prayer and charity?…It is putting things right between people” (Sunan of Abu-Dawood, Hadith 2310). Almost every family relationship will experience broken trust at some point. It is normal for trust levels to rise and fall over the course of a relationship. Some toxic family relationships can be repaired in the long run, but both people must be willing to work at self-growth. Having problems with family members does not necessarily mean they are toxic. Relationship problems are normal and can often be solved by honest communication and problem-solving. One question to ask yourself is, “Is this relationship harming me more than benefitting me?” If the relationship is more harmful, it may be toxic. Because of their unwillingness to take responsibility, it is difficult to repair relationships with them. Setting boundaries/limits is crucial. Part 3 of this article will discuss boundaries and other coping ideas in more detail. *Unlikely to understand how other people feel, or to even care. Toxic people act in these ways because it works to get their needs met. If it didn’t work, they wouldn’t continue acting in these ways. How to cope is complicated because every situation is unique. Here is a list of ideas. You should use your intuition and reason to choose the best course of action. Not all of these ideas will work for your particular situation. 1. Live for Allah (swt). Place your hopes in Allah (swt), and not in people. Allah (swt) is All-Seeing and All-Hearing, and He will reward your for your patience and sincerity. If you focus on Allah (swt) and on earning His pleasure, then you will try to be a good Muslim regardless of how other people act. 2. Try to show toxic family members kindness and understanding, but also limit your contact with them to protect yourself from their toxic behaviors. Many toxic family members are going through difficult times. They may be suffering from health and/or emotional problems. You can try to show them understanding to the best of your ability. If they request something from you, you can respect their requests (as long as they are reasonable and permissible in Islam). 3. Take care of yourself and know your limits. Remember to not “overburden” yourself. Take care of yourself by making duaa to Allah (swt), exercising, and expressing your feelings to a caring person. Many stress experts believe that the stress caused by other people is the most damaging of all stressors. Take responsibility for your happiness by finding ways to cope and relax. Also, do not take the toxic behavior of family members personally. They are the ones with a problem, not you. 4. Find peace in truth and wisdom. As quoted above, Allah (swt) is truly the Witness of all things. 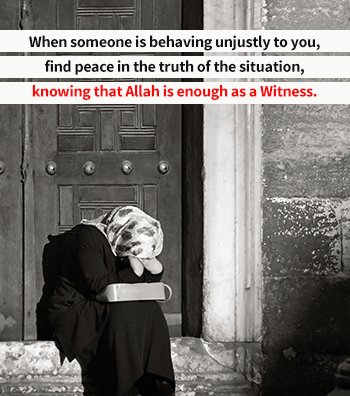 When someone is behaving unjustly to you, find peace in the truth of the situation, knowing that Allah (swt) is enough as a Witness. 5. Sometimes it is best to be silent. If you are not sure that what you are about to say to a toxic family member is “good”, then perhaps it’s best to keep silent. When a family member is angry or disrespectful, he/she is not in a state of mind to listen to reason anyway. If you are feeling angry, you may say something that you regret. Show forgiveness, enjoin what is good, and turn away from the foolish (Al-’A’raf, 7:199). 6. Listen to your intuition and use your reason. Use your intuition and reason to decide how to respond to a toxic family member. Many psychologists believe that intuition is simply your past knowledge and experience coming out in a fast message; this definition of intuition can also be called: wisdom. Islam teaches us to use our reason and to gain wisdom from our life experiences. For example: Use your intuition to decide when is the best time to talk about an issue with a family member. 7. Set and enforce boundaries and keep your distance. Every healthy relationship has some boundaries. Boundaries are limits that you set with other people. Examples: You can set boundaries about how often you will meet or talk to toxic family members. You can tell family members what kind of behaviors you will not accept from them. If a family member does not respect your boundaries, then you need to have some kind of consequence, such as leaving for some time. Surround yourself with positive people who care about you and support you. Use your support systems to help solve any problems you are having with toxic family members. 9. Sometimes it’s best to speak directly to toxic family members. Again, use your intuition/experience to decide when it’s best to speak more directly to a toxic family member about his/her behaviors. You can respectfully explain to them what they are doing that is disturbing you. Examples: You can say, “I feel insulted when you say…” You can also ask them, “That’s interesting…Why would you say that?” You can explain to them that you will not tolerate dishonesty, manipulation, or rude behavior. 10. Do not feel hatred towards toxic family members. Hating family members for being toxic only brings more toxicity into your life. 11. If their toxic behavior becomes physically abusive, it’s a legal matter that must be addressed. Showing kindness to family members is highly rewarded, but at the same time we need to take care of ourselves so that we can be kind, healthy people in the long-run. If your mental health is suffering from the effects of toxic family members, you should treat yourself with kindness and protect yourself from harm. Also remember that you are not alone and that many people suffer from toxic family relationships. You will be a happier person if you can avoid toxic family members and set boundaries. Setting boundaries is not easy; it means saying “no” and limiting contact. Just because people are related to you does not give them the right to be hurtful and dishonest. Family members are supposed to love and support one another. 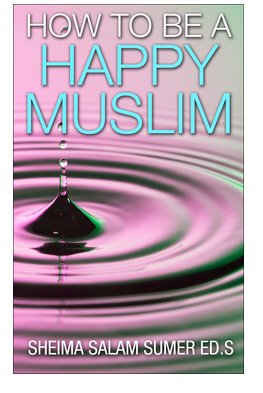 14 Tips to Be a Happy Muslim! Aoa. Your article was beautiful it was just what i needed at this point in time. I have a question regarding in laws. For some reason in our culture we have to live with in laws and my husband refuses to ever want to live separately. In case these are the toxic family members is it sinful or wrong to ask husband to want a separate house as we live with parents in laws sister in law with kids bro in law with a kid.In our culture the one who separates is depicted as the evil one. Kindly give some light to this matter. Wa alaikum as salam dear Sarah. Thank you for your comment. I do not think it’s wrong to ask your husband to live in a separate home. It’s always good to communicate respectfully in marriage. I would not want to live in the same home with toxic in laws. It is stressful and if your husband can afford it, it seems best to live separately. May Allah help you dear sister. Things can be so tough in a new family. I really hope it gets easier for you. Sister Sheima, would it be okay to email you regarding this same topic for some advice? Thankyou for this article. It is nice being able to relate to the inspiring words of the Prophet(peace be upon him). Thankyou for this information. You are very welcome. Thank you for your positive words. Thank you for the article…I have a question pls. My mother falls in the toxic category. She has, through her attitude lost all her relatives in laws and even siblings. She wants me to end ties with them also as the family do not invite her in any gathering. What should I do? Should I listen to mother and not meet my family or should I have my relationships regardless.. Thank you for your comment, Nida. You ask a difficult question. Well, Islam teaches us that we should obey are parents in only halal/allowed things. Your mom is asking you to do something against the teachings of Islam–to cut relations with family–so therefore you are not obligated to listen to her in this case. However, you may consider trying to have relations with your other family members in a way that your mother doesn’t know that you are meeting with them. Therefore her feelings will not be too hurt. I am sorry to hear that, Ishtiyaq. May Allah help you and your family ameen. I live in a joint family system and my aunt doesnot care about me… I have a very bad nature of becoming selfish and I hv fought with aunty verbally n earned my family’s wrath…at same time, my aunt is oppressed by my grandma and my father’s sisters as well as her husband…my aunt could hv hidden my rude words frome granny but she told it to her instead of explaining me the right way to behave. …mom says she has treated me unjustly after fight because she is hurt by granny…but I dont feel like talking to aunty anymore and i just simply cant forgive her as she has caused way more harm to me..i hv stopped talking to her, should I forgive her? Plz answer, waiting for ur reply.. Thank you for your comment, Anu. You can forgive someone and still have consequences for their behavior. So you can forgive her but if you don’t have the heart to talk to her, that is fine. Just respect your heart and when you feel ready you might start to talk to her again. Asalaamoalaikum. Thanks for the previous answer. I want to ask a somewhat strange question. My mother says that there is no advantage of praying or fulfilling other religious tasks until I give away the rights of others… I want to ask whether Allah only gives reward of our deeds if we please everyone around us..or has He given us the right to avoid annoying ones abd just try to be nice to all….in other words, are haqooq Allah more important than haqooq ul ibad ie rights of people? Plz reply…waiting for ur reply. .
Wa alaikum as salam, you are very welcome. Your mother is not correct. We must fulfill our religious tasks always. There is no excuse for missing religious duties. Now of course we also should fulfill the rights of others. Both are important. In my opinion, the rights of others are also the rights of Allah, since Allah teaches us to respect the rights of others. So both types of rights are the rights of Allah, because He asks us to do both. Another point is that there is a hadith that says that if we do not fulfill the rights of others, then our good deeds may be added to their good deeds. How may I change my selfish nature? Other than praying to Allah to help you to change for the better, you can also take actions to benefit others. Look for opportunities to help others. This will help you to be more other-focused. We lost our dad 4 months ago, and we sisters promised to keep the ties of kinship. I have upheld my end until my older sister and her daughter accused my daughter of stealing her makeup. It’s not true my daughter and all of her cousins have similar if not the same stuff… my niece didn’t see my daughter do it but assumes that stuff is hers because it’s the same as she had. We often go to the same makeup store to buy products and the girls discuss products and all cousins usually get the same stuff. I phoned my sister up to try and solve this issue but she said she believed her daughter. I felt very hurt and told her I’m just going to stay away from everyone to avoid problems. This is not the first time my sister and her family have hurt me and my family… they are very selfish and arrogant and feel they are the only ones who can afford anything.. I am an easy target as I forgive and forget and am very emotional about family and about angering Allah but this time it has gone too far.. my husband wants me to send her money and throw it in her face to make her feel bad about her cheap act. I am so hurt and I know she will never apologize because she thinks they are better and her arrogance and pride get in the way. This happens every year and I can’t take it anymore. It’s effecting my children and their mental health. I don’t want to talk to her until she apologizes but u feel confused as I am trying to be a good Muslim but I feel I need to keep my distance and let her feel bad for this accusation. Please help me!! Wa alaikum as salam dear sister, I am very sorry to hear of the loss of your father. I can see that you have good intentions, and of course Allah knows them too. If your mental health is suffering from this situation, then I would let myself heal during this time. I would avoid contact until I have the mental health to make contact again. Allah knows that you want to be a good Muslim. Allah will help this situation with time. So right now preserve you and your family’s mental health by avoiding contact and keep praying to Allah to ease this situation. Jazak Allah and thank you for your reply.. how do I avoid contact when I get invited to the same events as her? Or when she calls my house( I don’t answer) and talks to my mom ( after my dad passed my mom stays with me for a month and her a month) or when extended family has get togethers? Am I wrong for wanting and asking my mom to speak up ( as she heard and was a witness to everything) and tell my sister and her daughter that they were wrong and accusations baseless? My mom often treats me differently than the other 3 and it is very hard for me to understand why? I have been there for my parents the mist(cleaning, doctors, vacations) Am I not her child? I am hurting so much … I cry in sajda and when I read Quran… I try to be a good person and help people out but I always get walked on especially by my own family. How can I change? Why is this happening? Why is everyone on one side and I am by myself? Walaikum as Salam, wa iyaki dear sister. My sincere advice is that you focus on your self and your own inner peace. So take the focus off of your family members and work on improving your inner peace. Try to the best of your ability to avoid situations that cause you pain, knowing that you can’t control every situation. Just try your best. Usually when we are able to be in a consistent state of inner peace, Allah shows us how to proceed in our lives. I am struggling right now and I can feel my emaan is affected. I dont hav the will to do anything. Please make dua for me. My older sister and I have always had some kind of a disfunctional relationship. It is only until about 2 years ago that I came across a book called ‘stop walking on egg shells’,when I realized my sister fits th profile of bpd with narcissistic traits. I felt a relief knowing that I am not crazy as I always blamed myself, I never knew how to act or what to say around my sister cos she wud go into a rage over the smallest disagreement. I always apologized even when I knew I was not at fault, my mom is witness to it and she always tels me Allah will reward me. In th past I used to engage and say hurtful things back but once I realized it is a mental problem with her I try to disengage. Th struggle I hav now is that it is affecting me worse now. I try to avoid her but she keeps bringing up the past and th hurtful things she says sheshe feels no remorse. I feel like I don’t want her in my life at all anymore and im afraid it is damaging my Emaan for cutting family ties. I hav no will power to do anything this ramadaan cos I feel like all my good deeds r wasted for cutting ties. Pls make dua for me. Dear Sister I understand that you are really suffering from this dysfunctional relationship. I will make dua for you insha’Allah. This is the best month of the year so don’t lose hope. Keep asking for Allah’s help and guidance and He will help you. Allah tests those He loves. This test will bring you closer to Allah insha’Allah. I need help and support please. I’m all alone. My brother in law and his family have thrown my husband out for not being able to control him, his money, behaviour and conduct. They do this every year then apologize and call him back. He’s 50 and I’m 40. I have had to leave my home country where my husband is for a few months for a very sensitive issue. My husband is all alone. I’m all alone. He has no family to support him, nowhere to stay or eat as they took all his money slowly slowly weeks before, he thought he was just helping them. His nephew is 6 and my husband raised him. It’s like it’s his own son, we don’t have our own children. My husband is losing his mind and strength. He thinks life is nothing without the boy, which I agree. The boy is now being beaten up by the parent’s for missing my husband who raised him. We are willing to forgive them for the sake of the boy but they do this to us every year for last 10 years coz we have no kids. Please help us. What do we do? We can’t lose the boy, he’s our whole life.Please advise us sister. What is one to do if this toxic, mean person,in fact people are your parents? and they kill you a little everyday and no one breaks your heart more than them. You support them in their tough time and yet they do this. Its unbearable. Sometimes you even get angry and back-answer. None of them is very old either. Infact its the younger parent who is worse. They even hate the fact that the children have bonded well amongst themselves and they insult us for that. All of us are suicidal to say the least. Many Muslims and people struggle with toxic parents. It helps to see them as people who are not well, because they truly are not well. Asalamualaikum. I have read your article on IOU’s website and had to write here to congratulate you. Here you are adressing an issue a lot of people can relate to but which is so taboo! Yes taboo. All my life, at various stages, I have dealt woth people who gnawed at my peace of mind. With local scholars and wise people alike, all I was told was to have sabr. I was always told family first and any breach of the rule would mean either my imaan is weak or I lacl sabr amd will incur the wrath of Allah. Thank you for re inforcing my notion that I am allowed to keep an arm’s length with people who swallow every atom of positivity around me. I will not be cursed by Allah if I choose my sanity over nurturing mentally destructive relationships. May Allah reward you. Walaikum as Salam warahmatullah wabarakatu dear sister Sabah, thank you so much for taking the time to write this very kind and encouraging comment. Yes I totally agree with everything you wrote and I hope and pray that things will improve with your situation. Thank you for this post. It has helped me quite a bit just now. Its hard to find anything from scholars or the likes on how to handle parents as muslims. Does going far away from the toxic people apply with the parents? I’d like to go far away from mine.I cant begin to highlight or enumerate all what i have been through with my parents over the years, at least for the 26 years of my life, from accusing me of stealing, to punishong me for errors as a kid,to rubbing in how they fed me clothed me sent me to school(which in my opinion is a parents responsibility the moment you decide to bring children into the world), or complained bout how my fees would have made up for 5 cars in his compound, to me lso being a part of their disfunctionl system (honestly i dont know why they married each other in the first place at least i wont be here), raised by a mum who never really eaised me with love just beating me for eveey little thing, screaming at me, i cant even remember a lot of things. Failed promises. All my expectations jhsy being dashed, suffering and smiling with them through all the years things only got bad financially. To be honest i really feel its Allah who helped me saved me raised me cuz how i even.made it this far just taking care of myself, efforts not being appreciated, being compared to other people’s kids, i stopped asking them for anything right from secondary school especially my response for asking for money to attend the schools fathers day activity was slaps from my mum, she would constantly speak down on me, insult me, accuse me of things and expect me to just take it. I am tired really. Sick and tired already. Its exhausting. Its tiring. Its frustrating. Stopped asking for mkney for my masters, lacking in so many areas that my mates have gone far in life? Dad just acts like he iant bothered and still has the nerve to see other women all in the name of “four wives afterall” i dont even give a damn about that. But fulfill your responsibilities as a husband and the caretaker of the home first and my mum is just very hurtful, ungrateful, would just say hurtful things and we are just supposed to not do anything or flip. At this point i feel the only waay i can still maintain the tiny consiseration i have for them because of Allah is if i go far away. Thankfully i would be getting married soon even though i really thought in the middle of all this where they didnt prepare for my future in terms of education and creating a better life for me, they didnt prepare for my marriage either. After staying and enduring all these years this is what i deserve, a shabby farewell. Anything i ask for is too much. Anyway i have even forgotten about the walimah really. I dont care what happens. But i just want to go far away. I have had just about enough already. But i fear wont it seem like abandoning them.in the sight of Allah? Can i just go far away. Relocate to another country perhaps.? Salam and I’m thankful that I came across this post. I can relate to many traits of a toxic family member as you’ve listed down. I’m sad to say that my father is almost all of the above. I would like to seek advice regarding my current actions in my way of setting boundaries between him and I.
I keep myself busy with school and sometimes work, it is ramadhan now and after an argument recently, I decided to have my iftar at my grandmother’s with a white lie of ending school late and not able to make it home on time for iftar. Also, how do I refrain from thinking ill of my father? He is a Muslim but does not act like one nor has a character of a noble person. I also do not often make conversations with him unless needed thus, vice versa him with I as well. I do this because he doesn’t speak humbly or with love, and he is not the kind that is able to handle subtle jokes or actions/gestures because he may regard them as a direct offence/rebellion towards him which is the case 90% of the time. I redha and understand my duty to be a respectcul child and I’m upholding it on my end its just sometimes, when he gets out of hand, I’m unable to think positively of him and I am unable to forget what he has said and done to hurt me and my family. My family members and I shares tge same mindset so I hope to seek some advoce or thoughts on this. No pressure and salam ramadhan. I understood from your comment that your father is a toxic family member and you would like to set proper boundaries with him. You try to avoid him as much as you can. You wonder how you can avoid thinking ill of your father. Dear, it sounds like you are doing a great job already of keeping boundaries. You are still talking to your father but you don’t put yourself in situations that will cause fights/ problems. I think you should keep doing what you are doing. I also think that you do not need to avoid thinking ill of your father because that is just how you feel. You can think ill of him but still try to be as respectful as possible. Please feel free to email me more if you would like more advice. Wa alaikum as salam dear , I have sent you an email. Salam alaykum. I have spent my whole life feeling confused and not knowing how to handle my father. I was searching online for help on how to be a good daughter to a highly toxic narcissistic and possibly mentally ill father. I feel that keeping my distance from him is the easy way out. I still want to support and care for him whilst protecting myself from his words and bad behaviours. I was very glad to see this article. When I speak about my dad to close friends I feel like I am gossiping and that is haram. But you are saying we need positive support to cope with the situation. This made me feel a bit better. This helpee greatly improve my relationship with my sister but not my brother,what do i do?he abuses me bothe mentally and physically, when i try to defend myself feom his abuse he comes and beats me to,he never prays with us nor does he even read Quran, he threatened me and my sister that if i tell anyone, he will hurt us. When i talk to my mom about this while going in full details, she laughed at me because she thought it was just sibling rivalry…when i confront him about this he looks at me with descus, i tell him that Allah is not found of a man beating his younger sisters like this but he ignores me.If i go into detail about everything he does to me and my sister the this will be way to long. What should i do?? Assalaam’alaykum, Jazaki Allahu Khayran for all your work! I’m not sure if you are a mental health specialist and I’m not sure where you are based in but I have been trying to find 2 things in the city I live in here in the US. 1) my family and I need a Muslim therapist and 2) may need ruqya services. We have been living very very dysfunctionally for a good while now and our houseshold is just toxic. I am trying my best to find solutions that work and I want to seek these 2 resources but can’t find anything in my area. My dad has cheated on my mom since my siblings and I were little, they moved us all out to start over but he built his whole life around being a rich man and has treated us like trash in the process. Whoever didn’t want to help him with business, he turned them into enemies. It started with my siblings who worked for him. He made them feel like crap and they turned away and wanted to go their own paths. He has since found ways to ruin their lives and essentially no one can trust each other, we don’t communicate, we argue, those who use to come to the masjid have left Islam and the rest of us (mom, my youngest siblings and I) are struggling to stay sane. Even I struggle to make my prayers. I feel like I’m slowly losing it. I beg Allah to help us and mend and heal us. One of my sisters is a pathological liar and we see signs that she may involved in evils and living a sinful life. She is an adult and is out of control. She completely disrespects my mom in front of the young ones and I want to step in but she can get violent and threatening (I know from experience). We have no idea what to do. My brother use to go to the masjid daily and now he insults the religion right in front of my youngest siblings. My dad has since left out of the house after my mom had to repeatedly ask her distant uncles (because she doesn’t have anyone else; she comes from a family that are also dishonest to her and her parents have passed away (AY) she need them to intervene. My parents are separated and my dad pays the bills. He says he does all this for us. All his money is for us (we tell him we don’t want any of it). But the stuff he has my siblings going through, we cant help but think black magic is involved even before he left. All to get back at us and my mom. When he was living with us, My dad would wake up everyday cursing the house and all of us, being vulgar and crude. He would say threatening things. And he would say the same things when he returned home from work. He was not raised in a religious household and only since my mom has contacted her uncles, he has been going to jummuah and preaches to us after. It’s like a laugh and slap to the face. We have learned to not let our egoes get to us anymore and just stay shut and move forward in life. The siblings that use to work with my dad share the same characteristics of my dad with the dishonestly, being violent, and narcissism, etc. I don’t trust anyone. And don’t know how I can have any future healthy relationships. I don’t know if I should sit with any guys who are interested because I don’t know how to work through my families problems and then start on a new relationship in marriage. With the toxicity, I am now have made the decision that I don’t want children but may consider adoption islamically. So I am genuainly trying to figure out how to tell potential suitors this and all the other baggage and where to begin. I don’t talk to people anymore because of the shame of what others may know. I use to study and go to college. I’m not mentally capable of getting things done anymore. I’m very scatterbrained and suffer from memory loss for almost 2 years now. Since my dad left, I have been scared that he’d send someone or he himself would hurt us. I’ve always been scared that he would hurt us while he lived with us, and especially now that he is not. Wallahi I just had a dream that he walked in to the house, barged into the room and said “sorry I have to do this” then lifted a gun towards my brother. I jumped and woke us and started crying. And now I’m just looking for real solutions. I know Allah will protect us. I just want to tie the camel. JAK, wassalaam. I have sent you an email dear Aqsa. I have been abused by my husband for over 15 years.he is using all kinds of bad words against me and my family.i was tolerating it for over years and he is restricting And forcing me to stop relationship my mother and my family.i m totally stressed. His parents r also supporting him.whenever I asked permission to visit my old mother he uses dirty language on me and my mother. Very very very foul words which a wife can’t bear. I asked for divorce . He says he won’t and trouble even after that. I have 2 sons.i don’t know what to do now.please give me some solutions for this. Your article is so comforting and assuring, May Allah increase your iman. Assalamualaikum. First of all,thank you for your article as it strongly relates to me and my husband’s lives. We really need your guidance on the matter below as we are at loss although we’ve gone through countless of self-help books and videos. I was physically and mentally abused since I was a child, and after I got married, my parents continued to do the same to me and my husband, including forcing me to disobey my husband’s orders such as visiting his parents, picking him up from work or preparing his food. They even allowed my siblings to do the same to us. To make things worse, they forced me to use my name for their house rental and refused to pay (despite knowing that I’m unemployed) until I was almost declared bankcrupt; I even begged them to help me with the rent but the beat me instead and yelled at my husband. Even my husband’s salary was almost entirely used to support my parents and siblings’ materialistic and hedonistic lifestyle. FYI my parents are still working and are in good health status. After a year, we moved out to save our marriage, but they continued to harass us and forced us to go to their home to do their chores, or else they’ll curse, beat and even threaten to label us as disobedient children so we would receive Allah’s wrath. We tried to keep in touch with them, and the last words we said to them was “Call us whenever you need help from us, we’ll be there”. Whenever we called them to say hello, they always yell and curse back at us. Eventually we keep our distance for our safety, but all we heard from our relatives was that my parents told my siblings and relatives that we are an evil couple, going so far as saying that we are the ones who abandoned them. We decided to cut ties with my parents because they go against Islamic teachings, and we want to stop the abuse, but we are not sure if this is permissible in Islam. As far as I’m concerned, after the marriage aqad, I am under my husband’s authority and therefore my parents have no rights over me, but my parents told me they continued to abuse me (and later on abused my husband as well) after I’m married because they could not accept the fact that they lost their authority over me. Are we doing the right thing? Please say we do! We’re haunted by these thoughts evey single day. I came across your article and Alhamdulillah it was very insightful. I was looking for advice on my family conflict. I am a middle sibling of 5 Alhamdulillah. Just over 2 years ago my mother passed away, during these 2 years I have learned that holding onto things really has no place in our lives as when we die and face Allah swt on judgment day, we will all wish that we should have forgiven when on earth. I am still human and still get angry and argue like anyone else but let go and forgive easily. However, recently my father and sister had a very bad falling out. My father is a very difficult man to get along with. He can be stubborn and arrogant. Alhamdulillah he does have a lot of knowledge about Islam. Basically what happened was that my father called my sister over the phone one day and started having a go at her about his family, which in turn lead my sister to go a bit psycho and she started insulting my father. She used really bad language and told him all that he has ever done wrong his kids, my mother and grandkids. What she said was probably all true but how she said it was heart breaking for my father and too be honest heart breaking for all brothers and sisters. Too be insulted and to be called names. I have told her she is wrong and must apologise to him face to face regardless of how he may react. But she hasn’t. Unfortunately because of this the rest of the family have stopped speaking to her. And what pains me the most is I can’t express to them how bad this is or how wrong they all are as they get upset and become hostile and may stop speaking to me. As I am the only one who thinks this. My sister has done this many times, insulted my father and my mother is the past. I guess they have just had enough. Anyway, what I wanted advice on is that my sister is now getting her daughter married, non of the family have been involved in any of the preparations as sister didn’t want that. And she informed my father by text of the marriage. He has told all of us not to attend the wedding and he will definitely not be attending as he decided to go back to his home country and won’t be back until just after the wedding. I have told him I am going as my niece and I have always had a very close relationship and I also know that I am right in not breaking family ties as this is Allah’s swt command. My father was holding onto my sister’s gold that she wanted to pass onto her daughter and he is now refusing to give her this. His reason for this is that she divorced her 1st husband (father of daughter getting married) and she also put my brother 50k in debt which she refuses to pay. My father says he paid for this gold and she divorced her first husband so it no longer belongs to her. Sister says that my mother said she could have it for her daughter. My mother is not here any longer so I can’t ask her. Who is right in this instance. I come from a very dysfunctional family but Alhamdulillah all my siblings are practicing. I am at a stage in my life where my husband who doesn’t have close ties with his family members, believes I get too involved with people. I don’t agree with him but have noticed how my kindness (subjective) has lead to people blaming me or me losing relationships because i always want to help. I hope you can make sense of my comments and respond back and guide me with blessing of Allah swt. I want to consult something.Yesterday after I had an argument with my mother, I went on internet research.And I saw that my mother has two things. One is a toxic parent and the other is a personality disorder. They divorced when I was a kid, no dad. My father is also selfish, filthy.i am not seeing him. My sister is working because of my parents’ selfishness in a job she has not liked since she is 18. She is 26 years old and is tired. At first, he paid a lot of money, but my mother was spending it on himself.Now she has a salary but he is still told that money is not enough and she doesn’t buy anything, and nothing.expect yourself. She bought himself some kinds of clothes, shoes and derivatives.for herseflf. In my internship, I only changed 2 outfits.I said that in a fight, but my mother still said to me that I was ungrateful. during this time we endured everything.sHe’s been having an affair with a man in the last year. In fact, I can not say secretly fooling us. There are 5-6 roses in the room.is an idiot who won’t understand.We read the message, screaming at home to understand the phone call.He was a selfish, a liar, and he was just talking about his troubles. she can put forward every irrelevant issue to justify himself. including those children from Syria. .She finally said, “You’re ungrateful, and I won’t forget it my whole life.”my mother is spiteful, we grew up with bad prayers when we were kids. he is eating unhealthy, he works in disgrace but he loves his job. And now she’s acting like we are the responsible.After reading all the articles, I didn’t know I wasn’t guilty, so I was relieved. Due to this relationship, my sister cut the money because it was uncomfortable. I wonder if I’m still the culprit? Would I be ungrateful if I wanted to leave home for the university? Isn’t it a problem for my mother to be a selfish, liar, and self-thinking person? I’m running out and I feel like guilty. Thank you for taking the time and trying to open the jams of my heart. At first, he paid a lot of money, but my mother was spending it on himself.Now she has a salary but he is still told that money is not enough and she doesn’t buy anything, and nothing. She bought himself some kinds of clothes, shoes and derivatives. during this time we endured everything.He’s been having an affair with a man in the last year. Wa alaikum as salam dear Sister. I have sent you an email. Jazakillah khayr for this article. I was researching the Prophetic way of dealing with toxic people and your article popped up. Thank you for addressing the fact that it is not a sign of low tolerance or iman to want to avoid toxic family members and that it is incumbent on us to nurture our mental and spiritual health. I pray you can expound on this further and other such topics in the future inshaAllah. Wa alaikum as salam dear Sister, thank you for your thoughtful comment. Wa iyyakum. Insha’Allah I hope to expound on similar topics in the future. Assalamu alaykum sister. Google search led me to you alhamdulillah. What to do with a toxic mother? She affects everyone in my family. I am married alhamdulillah to an amazing man who would literally do anything for me and our 3 children. Devout Muslim alhamdulillah and very kind in nature. She never liked him. From the start. Not even his family. She always bad mouth them saying that his mom is dealing with black magic. Tries to make me and my children hate her. In reality, my mother in law is a lovely lady who’s been better to me than my own mom. My kids also hate my mom. She makes them feel really uncomfortable and scared. They don’t want to see her or talk to her on the phone. We don’t live in the same country but that still makes me feel awful. Whenever I see that she’s calling my stomach turns and I get chills. There’s always drama around her and every time I visit is so dramatic and I leave the place in tears. I don’t know how to handle her or the situation. It’s so exhausting and mentally draining. I only go there for summer and see her only once or twice during that time. I don’t take my kids with me. I go alone. And she makes me feel miserable for not bringing them but when I do she scoldes them and and they cry and feel like they did something wrong. They’ll be like what did we do, why did she say stuff like that, why is she like that with us… I have no answer for them. I don’t know what to say when they ask why does she hate their dad. I have no answer for them when they ask why does she make me cry all the time. They all teenagers now and are lovely kids. I am at a complete loss. Thanks. I’m a revert, and have been for 11 years now, I met my partner about two years ago and have got married now. When I first met his family they were all so very nice, and they still are, but now I feel insignificant. They ask standard questions how are you, but after that nothing, like their not interested. A few months before me n my partner got married his sibling got married, if she’s over though, everyone has something to say to her and they don’t kill off the conversation. I’m always getting compared to her, like why can’t u be more like her, or she does the work u do. I feel little, my partner has one sister who met me and his siblings wife only months apart, but the sister can’t spare a moment to text me, but can text the siblings wife all day long.. another thing happened, my birthday came, and everyone knew, they said happy birthday and wished me well, I was happy, but then the siblings wife birthday came, and everyone was bending backwards to get gifts or see her. I’m also an introvert, so I’m quite quiet and try to get along with everyone, but I love me own space so being in a crowded room, I do get overwhelmed n want to leave, I don’t feel comfortable n gets awkward for me. But I make the effort to come so partners happy n his family don’t think I’m avioding them, but I don’t even feel like going anymore to be honest.. I go to try my best not to feel negativity.. Please help, is the problem me? Alhamdulillah so much important information for me, thanks for sharing.